The labels have a 26mm diameter and are available with either removable or freezer adhesive. a 10c deposit which must be included in the retail price of the product and be refunded when the container is returned to a collection point. In order to facilitate retailers and wholesalers in the application of a label to display the availability of the 10c refund to customers, Gleeson Agencies now have a pre-printed label than can be easily applied with the aid of a label dispenser. It makes the job quick, easy and is very economical. Contact us for further information. Due to Australian legislation. 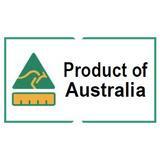 "Product of Australia" labels can be custom made with your requirements and can be dispensed from a gun. Example below.